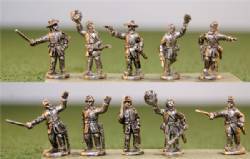 15mm scale - 15 figures per pack consisting of 3 Officers, 3 Sergeants, 3 Drummers, 3 Hornists and 3 Eagle Bearers. 15mm scale - 12 figures per pack. 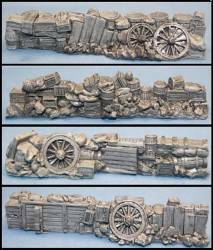 15mm scale - Set of 6 resin haystacks. 15mm scale - Resin fences, set of 6 short fences and 2 corners. 15mm scale - Set of metal split rail fences. 15mm scale - Set of 4 resin fences, 1 wall with gate and 2 corners. 15mm scale - Set of 5 resin fences, 1 short corner and 1 tall corner.